Project obstacles and solutions: Toyota Motor Manufacturing Indiana in Fort Branch, Indiana announced they were expanding their facility to accommodate increased production of the Toyota Highlander. This included increased parking lots for over-the-road carriers bringing parts to the plant and moving new vehicles to market. E&B Paving was selected as the contractor to pave two parking lots with roller compacted concrete paving (RCCP). 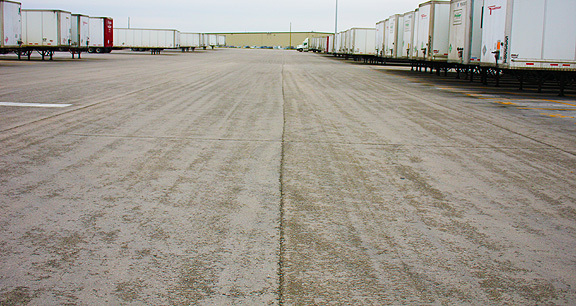 RCCP is a durable mix that is used where heavy traffic is expected. It is extremely dense, so much so that it needs no air entrainment in the mix as it will not allow water to penetrate the concrete. It also can be driven on within 48 hours of being paved. In a manufacturing setting, it has proven to perform very well. IMI provided imix Roller Pave, a high density, no slump concrete that is designed to work with high compaction concrete pavers. IMI set up a twin shaft mobile mixer under their Fort Branch plant to produce up to 750 yards of imix Roller Pave per day. One parking lot required 10,000 yards of RCCP and the other required 7,000 yards. To meet the demand of the pavers, IMI used tri-axle dump trucks to move the material to the job site. E&B Paving completed the larger parking lot in 14 days and the other in 8 days. For more information imix Roller Pave, click here.